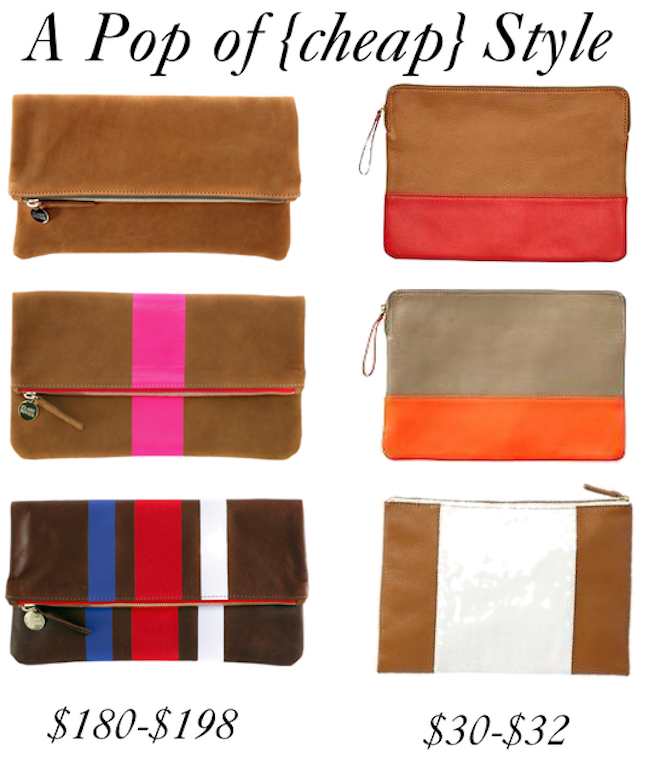 I've been looking for a camel brown leather clutch for some time now, and I can't think of spending over $150 on one. I have a faux leather crossover foldover from H&M that they still sell in stores, but it's half a bright/orangey color and doesn't go with everything. My favorite style is by Clare Vivier, but I can't pull the trigger on a clutch that costs about the same price as about a month of groceries (I'm on a tight budget!) I recently found something very similar to it at Gap, at nearly a quarter of the cost. I'm loving the brown and white one from Gap. That one with the neon stripe is so cute! Yes yes yes! Love them all. Sometimes I find cute 'catch alls' aka makeup bags and turn them into clutches.